I'm preparing for my third visit to Afghanistan and I'm eager to get my boots on the ground. We should only assist countries that want us and we should be for hire...isn't it a pity that the Chinese got the oil pipeline in Afghanistan. We can not keep spending BILLIONS of dollars outside our country when our own infrastructure is crumbling. I like what I read here in US ARMY Stand To: but to accomplish this...they are going to need women! In order to get these women they are going to have to open up the combat designation and allow women these positions, if they qualify, so they can advance. I know some of you reading these blogs might be saying...enough. But, considering this incident has cost 35 lives and set our accomplishments back to square one I want to understand what really happened. New details about a Koran desecration may do little to soothe Afghans like the youths protesting at Bagram Air Base last week. The crisis over the burning, carried out by American soldiers near the detention center in Parwan on Feb. 20, brought a short-term halt to cooperation between the Americans and Afghans and has complicated almost every aspect of planning and negotiation for a military withdrawal. 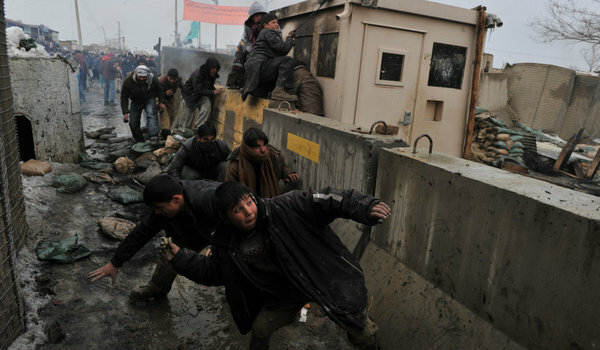 The burning touched off nationwide rioting and the increased targeting of American troops, leaving at least 29 Afghans and 6 American soldiers dead in the past week. Read more about what possibly happened. With less than two weeks before I'll be in Afghanistan, I'm wondering how this will effect everything.